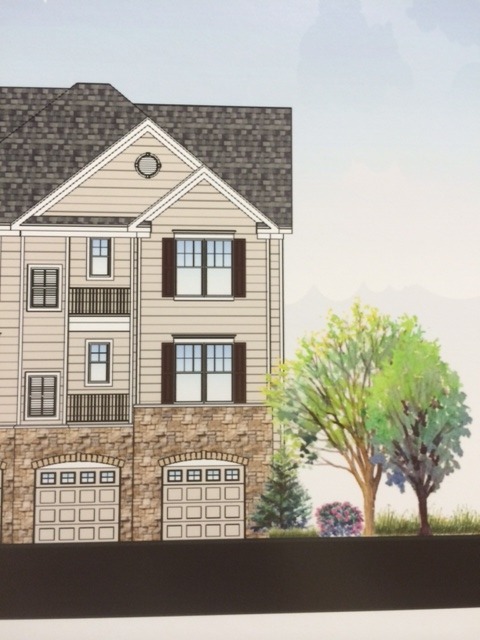 Construction is underway and now is the time to choose your unit and pick finishes and selections at Lakeland Village, a 76 unit townhouse and condominium community located at 86 Fourth Avenue in Haskell, NJ. Greentree Development Group, LLC of Howell, NJ is developing the project which is being marketed by CENTURY 21 Crest Real Estate, Pompton Plains, NJ. Lakeland Village will feature a total of six buildings: 36 multi-level townhouses in four buildings and 40, one-level condominiums in two, 20 unit buildings says David Gunia, President of Greentree Development Group. Square footage of each unit will range from 1324 sq. to 1682 sq. ft. for the two bedroom townhouses and 820 sq. ft. (1 bedroom) to 1324 sq. ft. for a 2 bedroom condo with garage. All townhouse units will include garages and either a patio or a balcony. All condos will have a balcony. Lakeland Village is nestled in the heart of the Ramapo Mountains, just minutes from Interstate 287/80 and the New York/New Jersey Metropolitan area. This convenient location is a short driving distance to some of the world’s best Shopping Malls, renowned restaurants, International Airports and to the city that never sleeps… New York, New York! Pre-construction pricing is starting at $189,000 for a one bedroom condo unit and $225,000 for a two bedroom condo unit. Multi level Townhouses will start from $274,900. Information are available now at Lakeland Village’s Sales and Design Center, at CENTURY 21 Crest Real Estate, 142 Route 23 North, Pompton Plains. Sales Center hours are Wednesdays and Thursday, 6 to 8 pm, Saturdays and Sunday’s 11 am – 4 pm and by appointment by calling (973) 646-7476. Lakeland Village will boast exterior designs with stone features and maintenance free vinyl siding. Decorative streetlamps, community-planned green spaces and energy efficient features have all been included in the complex’s design. The complex will include two exits and entrances for vehicles, via Fourth Avenue and the Boulevard. Interior features include, among others, hardwood flooring, maple cabinetry in choice of style and color, granite counters in Kitchen and Baths, stainless steel Kitchen appliances, Tiled bath floors and shower/tub surrounds, walk-in closets in master suites, decorative and recessed lighting and washer and dryer per unit. Lakeland Village is adjacent to Parkside at Wanaque, another Greentree Community that was completed and sold out in 2014. Information about Lakeland Village can be found at www.lakelandvillageliving.com. Wanaque moves toward redeveloping US Aluminum propertyFEBRUARY 20, 2014BY HOLLY STEWARTSTAFF WRITERSUBURBAN TRENDSPrint[The U.S. Aluminum plant on Fourth Avenue in Haskell may soon become an 80-unit residential community tentatively being called Lakeland Village. ]PHOTO BY HOLLY STEWARTThe U.S. Aluminum plant on Fourth Avenue in Haskell may soon become an 80-unit residential community tentatively being called Lakeland Village. As expected, the Borough Council has introduced a measure that will permit a proven development company to build an 80-unit residential complex on a parcel previously zoned for commercial use. Ordinance 4-0-14, introduced at the Feb. 10 meeting of the council, amends the existing redevelopment plan for block 435, lots 5 and 5.01, commonly known as the U.S. Aluminum factory located at 86 Fourth Ave.
Greentree Development Corporation, LLC of Howell was already designated as redeveloper of the property with a resolution passed by the council on Dec. 9, 2013. The firm is currently completing construction of the 88-unit Parkside at Wanaque residential complex on the site of the former American Candle Factory just across the street on Fourth Avenue. Since 2005, the borough has been actively seeking redevelopment of several properties in the Haskell section of town. As outlined in Ordinance 5-0-09, much of the neighborhood was reclassified as an "Industrial-Mixed Use (IMU) zone." The same document designated the borough to redevelop the U.S. Aluminum site as the location for the new municipal building, but that idea was scrapped after an environmental study showed that the property required remediation for low-level contaminants. As amended, the redevelopment plan extends the Fourth Avenue Residential (FAR) Zoning District, created in 2012 to encompass the Parkside complex, and renames it the Fourth Avenue Residential Overlay Zone to include the U.S. Aluminum property. Borough Administrator Tom Carroll explained the need for the amendment during the Feb. 10 meeting of the council. "We had a prior redevelopment plan on this property for commercial," he said. "The amendment incorporates a lot of what was already done at Parkside." Carroll laid out the timeline for the immediate future of the amendment measure. The ordinance, which passed on its first reading with all council members present voting in its favor, will be heard by the Planning Board at its Feb. 20 meeting. "They will make a recommendation back to this governing body by the March 10 (council) meeting," Carroll said. With final passage of the ordinance on that date, Carroll said, Greentree representatives would be able to take their proposal to the Planning Board for preliminary site plan approval. Before the vote was taken on the ordinance, Greentree Division President Dave Gunia offered the council an overview of his company’s plans for the U.S. Aluminum property. Gunia went over exterior and interior renderings of the buildings created by Thomas J. Brennan Architects of Plano, Texas. Gunia said that the project would be a mix of stacked townhomes and one-level living spaces called flats. "We built them in response to the somewhat overwhelming number of buyers looking for one-level living with a garage and storage," Gunia said, "as opposed to two-story up and down living." Of the 80 residences planned, Gunia said, 10 will be affordable housing units with three bedrooms each. The rest will be market-rate units with two bedrooms a piece. All of the units will be contained in a total of six buildings in three different configurations. Gunia said that four of the buildings would contain townhomes with three levels, and the other two would offer condo living on one level. Most of the homes would be included with a garage and a driveway in front of the building. The affordable housing units would be placed in the two buildings without garages, he said. The complex will include two exits and entrances for vehicles. "We designed the site in such a way that you can enter via Fourth Avenue and the Boulevard just west of intersection," Gunia said. Gunia said that Greentree will clean up the property "to a state of residential cleanliness." Groundwater contaminants will be treated and monitored without impacting the "constructability and livability of the project," he added. City water will be used for both irrigation and residential purposes on site. Borough residents raised questions regarding traffic, parking, and rainwater runoff on the property. Borough Attorney Anthony Fiorello said that the design specifications would be fully vetted by the Planning Board, and he invited the public to attend that body’s next meeting scheduled for Feb. 20 at 7:30 p.m.
Fiorello asked Gunia what the name of the development would be. Gunia said his firm was considering "possibilities to add a new flavor and personality to the area," and that one thought was to call it "East Village" while renaming the entire neighborhood "Metro Square." However, he added that they would be willing to take recommendations.